Photo albums are a perfect way of collating, curating and protecting your most treasured moments. At Aspinal, we believe that putting together an album should be part of the fun. Our range of album accessories will help you arrange your photos easily, tidily and beautifully. The simple to use adhesives will ensure you get your album looking every bit as special as the memories it represents. Sticking in your photos should be simple, easy and fun! There are many methods you could use, an ordinary dry glue stick available from any stationer or traditional photo corners which can be purchased above. 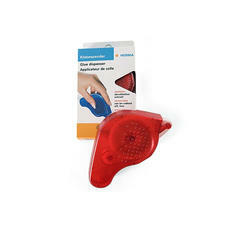 We also provide the very latest technology in miracle adhesives from Europe. The HermaFix adhesive Dispenser is a small roll-on adhesive gun, that you just roll over the back of each photo and then place on the page. Small round balls on adhesive are dispensed and hold the picture securely on the page. If at any time you want to remove your picture it will lift off easily. HermaFix adhesive is completely safe and allows you and your family to enjoy and experiment with layouts and pages as much as you want and to change them as much as you need, until you are completely happy. There is no time limit. If you do remove the photo you can lightly rub the adhesive off the page and photo and it literally disappears! It really is that simple and convenient and it really does work! For your convenience, you can also purchase refills for the dispenser. 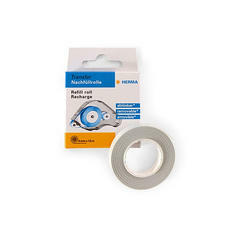 Each adhesive dispenser and refill carries 15 meters of adhesive.